I have often spoken about the fact that the United Nations is an organization which has been widely infiltrated by occultists and propagators of the "New Spirituality" (New Ageism). In the book "The Aquarian Conspiracy", by Marilyn Ferguson, a survey of New Agers showed that the leading influence on their spiritual "awakening" was Pierre Teilhard de Chardin. "Teilhard [de Chardin] had always viewed the United Nations as the progressive institutional embodiment of his philosophy"
(Robert Muller, ed., The Desire to be Human: A Global Reconnaissance of Human Perspectives in an Age of Transformation, Miranana, 1983, p.304). As the darling of the "New Spirituality", Teilhard de Chardin rigorously applied his monist, evolutionary philosophy to the world political situation, leading him to advocate a vision of some kind of one-world government. "Although the form is not yet discernible, mankind tomorrow will awaken to a 'pan-organized' world". From the very start of this un-foldment, three occult factors have governed the development of all these plans". This is largely under the control of many fourth ray disciples, if you could but realize it, and their point of meditative focus is the intuitional or buddhic plane - the plane upon which all hierarchical activity is today to be found". To this end, the Lucis Trust (formerly known as the Lucifer Trust), under the leadership of Foster and Alice Bailey, started a group called 'World Goodwill' - an official Non-Governmental Organization within the United Nations. Readers should bear in mind that 'the reappearance of the Christ', as stated in Neo-Gnostic literature, is not to be confused with the biblical concept of the Second Coming of Jesus Christ, but refers to the 'World Teacher' who is expected to lead humanity into a forthcoming Golden Age on earth. But the esoteric work inside the U.N. does not stop with such recognized occult groupings. Much of the impetus for this process was initiated through the officer-ship of two Secretary-Generals of the U.N., Dag Hammarskjöld (held office: 1953-1961) and U Thant (held office: 1961-1971) who succeeded him, and one Assistant Secretary-General, Dr. Robert Muller. "Dag Hammarskjöld, the rational Nordic economist, had ended up as a mystic. He too held at the end of his life that spirituality was the ultimate key to our earthly fate in time and space". 'is dedicated to the God whom man worships under many names and in many forms'. We will save for a later time to show how this syncretistic notion is fundamental to the development of the New Spirituality, the New World Order and to the generation of its Occult Millennium here on Earth. In 1973, the U.N. Secretary-General U Thant - who was also a mystic - formed the organization 'Planetary Citizens' with a New Age activist called Donald Keys. This is yet another Non-Governmental Organization within the U.N. which is devoted to propagating the New Gnosticism. "devoted to preparing people for the coming of the new culture"
[J. Gordon Melton (ed. ), New Age Encyclopedia (Gale Research, Inc., 1990), p.357]. In a revealing connection, Donald Keys has been actively involved with the New Age Findhorn Community in Scotland and writes regularly for its magazine 'One Earth'. The spread of New Age values as a unifying "yeast" in the human loaf may be the critical ingredient for successful emergence from the 1980s". "To what extent will New Age energies and values invest the human scene in the 1980s?" And he answers: "Without doubt it will have a major impact throughout the world on the value content of governance and the way life is lived"
That this has been successfully the case, there can be no doubt. We now have all the talk about a New World Order, and the present President of the most influential country in the world is the most sympathetic man to the New Gnosticism that one could have in the White House. His deputy, Albert Gore, is also completely in tune with the ambitions of the New Spirituality. It is also surely of some significance here that Javier Perez de Cuellar - Secretary-General of the United Nations from 1982-1992 - is reputed to have been abducted by aliens on 30th November 1989. [The Independent on Sunday (UK), 2nd January 1994, p.10]. Perez de Cuellar has persistently refused to speak about this experience. However, in response to an enquiry about the matter from the Prince of Liechtenstein - a leading world authority on UFOs - he did not deny that it had occurred. Whether or not this event really happened, its public disclosure through the international media could easily be part of a softening-up process designed by "security agencies" to prepare people to accept the idea of a relationship between alien beings and world government leaders. 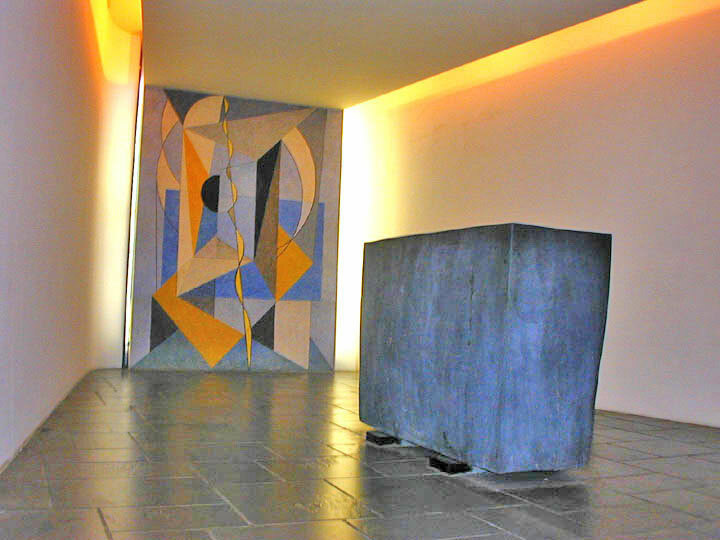 One has only to enter the so-called "Meditation Room" at the U.N. Headquarters (click image right) in New York to recognize the dark antichristian origins of the spiritual philosophy which has conceived and pervaded this organization. 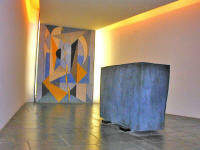 The bare wedge-shaped room with its eerie lodestone altar, and the cryptic, Picasso-like mural on the smallest wall, symbolize the empty heart of countless esoteric religious cults down the ages. It therefore comes as no surprise to learn that the U.N. has its own official Indian meditation instructor, Sri Chinmoy, who holds two meditation sessions per week within the U.N. building, and whose specialty is to lull his audiences into trance with music! Dr. Robert Muller also sheds some light on the relationship of the United Nations to the "New Spirituality". He rewrites the first chapter of the biblical Book of Genesis to make it refer to the creation of the United Nations. "And God saw that all nations of the earth, black and white, rich and poor, from North or South, from East and West, and of all creeds were sending their emissaries to a tall glass house [i.e. the U.N. Headquarters. AM] on the shores of the River of the Rising Sun, on the Island of Manhattan, to stand together, to think together, and to care together for the world and all its people. And God said: "That is good". And it was the first day of the New Age of the Earth'. In another of Dr. Muller's books, "Decide to Be", we see the New Age philosophy perfectly set forth. "Decide to open yourself to God, to the Universe, to all your brethren and sisters, to your inner self...to the potential of the human race, to the infinity of your inner self, and you will become the universe... you will become infinity, and you will be at long last your real, divine, stupendous self ". In the mid 1980s there was a particular flurry of activity on the part of the United Nations "New Spirituality" infiltrators to activate its potential global influence. This surfaced initially in the series of "Peace Meditation" days sponsored by the U.N. and "fronted" by a variety of celebrities who are sympathetic to New Age ideology. These two "Peace Meditation" days were designed to frame the United Nations "First Earth Run" which began on September 16th 1986 as a flaming torch was passed from hand-to-hand around the world, culminating on December 31st 1986 when it ignited an "eternal flame" at the U.N. headquarters in New York. The first peace meditation was called "The Million Minutes of Peace Appeal", while the second was entitled "The World Instant of Cooperation". "Are you ready to take the world in your hands?" Although it was concealed from the general public, these deceptive occasions were masterminded by an international galaxy of esoteric organizations and individuals who have been working closely with the U.N., and whose spiritual beliefs, affiliations and aspirations are thoroughly in accord with the "New Spirituality". For these United Nations events were actually the brain-child of four leading occultists and global "en-visionists". "to continually document the truth that man is a spiritual being possessing all the powers of the spiritual realm... that man is indeed God individualized, and that as man realizes his true identity, he becomes a Master Mind with dominion over the material world"
Others involved in the conception of these United Nations Meditation Days were Barbara Marx Hubbard, whose 1983 book "Revelation: the Book of Co-creation" called for a Hundredth-Monkey-style "planetary Pentecost which would alter the world's state of consciousness"
At least two of these individuals openly advocate psychic communication with spirits: Both Barbara Marx Hubbard and John Randolph Price are among the catalogue of celebrities who are quoted on the covers of Ken Carey's "channelled" books in the "Starseed" series published by Harper/Collins. Such is the background to this U.N. occult jamboree, designed to introduce ordinary people of many faiths and Christian denominations to the realms of occult meditation at a global level. In fact, the organizers were living out their belief that there will be a critical point at which a "breakthrough into a new planetary consciousness" will take place if they can induce enough people to meditate on the planet at any one time. One of the major reasons that the U.N. has become the haunt of organizations and individuals seeking to bring about a one-world antichristian political and religious consciousness is that it has a ready-made global network which can be easily infiltrated and used by clandestine forces. Furthermore, it easily fulfils the preparatory plans of those secretly controlling the world government which will lead to the so-called Golden Age on earth envisaged within the New Spirituality and New World Order people. The primary work of the United Nations since the time of its inception has been to soften people up to the idea of a world government which will have complete jurisdiction over the sovereignty of national governments. That is why the U.N. has suddenly come into such prominence as the "policeman of the planet" during the late 1980s and early 1990s. This does not mean that the present U.N. and its Security Council, as it is presently constituted, will necessarily be the actual World Government itself -- although it is certainly the primary harbinger. There have been a great many contributory factors in this softening-up process, of which the foremost has been the careful erosion of the concept of national sovereignty across the world. To this end, former 'Iron Curtain' countries have been systematically 'democratized' (orchestrated by the shadow world government powers) so that long-standing, covert, nationalist bitterness could once again rise to the surface, leading eventually to calls for a world government. To imagine that the dismantling of the Iron Curtain has been the result of a series of independent, spontaneous, popular people's revolutions is the height of naivety. The present writer has seen numerous intelligence sources which show that the political structures of the Soviet Union and its satellites (e.g., East Germany, Poland, Hungary, Romania, Czechoslovakia, etc.) have been systematically dismantled by the same secret powers which originally set them in motion. Mikhail Gorbachev, former President of the U.S.S.R. and now President of the International Green Cross/Crescent, was groomed for his role in this by predecessor Yuri Andropov, and is a major protégé of the secret world government which is even now in force. As a final proof here of the determined involvement of occultists in the United Nations, read the following report of the visit of a couple of New Spirituality people (who call themselves "Lightworkers") to the United Nations in Vienna in order to bring channelled information from discarnate entities ("Channelling" means bring oracular revelation from spirit-beings; references to "The Group" below refer to the group of spirit-beings which are bringing the messages). Steve Rother and "the Group"
The United Nations Vienna International City Vienna Austria Steve and Barbara Rother present a live channel from the Group to a gathering of Lightworkers at the United Nations in Vienna. What follows is a very powerful channel that offers suggestions for all of humanity on living in the higher vibrations of our new Planet. We arrived in Vienna at 9 am after 13 hours of flight time from San Diego. Vienna is a beautiful city with rich heritage. This was the first time that Barbara and I had been to Europe and we were quite excited about this trip. Our Host, Lourdes Resperger, met us at the airport with a bouquet of flowers that set the tone for what was to come. She is the president of the Vienna International City Esoteric Society that hosted this event. Our Hotel was very near a canal off the Blue Danube River. We decided to check into our hotel and get some rest before attending the channel at the United Nations at 4 pm. I was not at all nervous about the event and was really looking forward to it. I did not know what to expect but it didn't bother me. Eva Reinerman from Brussels and her mother Helen met us at our hotel, later that afternoon. Together we traveled to something called the Vienna International Center, on the "underground". This was kind of strange for me because when I looked around I became acutely aware that I was the only one on the subway carrying a sword. No problem, I have found myself in stranger situations before. Explaining the sword to many customs officials has given me wonderful stories to tell at the seminars. We arrived at the entrance to the Vienna International Center. We had to present our ID and go through security because we were entering a country within a country. Everyone lined up and they checked our passports and gave us badges. Then the moment of truth as the security guard asked all of us to place our belongings on the x-ray machine. I really didn't want him to go into panic when he saw the sword show up on his screen, so I told him ahead of time that there was a sword in the case I was carrying. His eyes got really big. This is a look I have seen several times before. "Why are you carrying a sword?" You would think that after being asked that same question time and again that I would have a well versed answer ready and waiting. Not so, I stumbled out something to the effect that it was a ceremonial sword. Now his eyes got very big as he visions of human sacrifice shot through his brain. Then he spoke the all too familiar words: "I think I'd better get my supervisor." The funny part is, when the case actually opens, I watch as highly trained security guards of the United Nations turn into little wide eyed boys at first sight of the sword. After passing inspection we proceeded into this city. This place was huge and there were many buildings that make up he Vienna International Center. This is a home for the United Nations, UNIDO Untied Nations Industrial Organization and the International Atomic Energy Agency, UNOV and UCBDO. Upon entering the main lobby area all the international flags could be seen hanging from the ceiling. We went up several floors to the room where the channel was to be held. I shared with them how this whole thing got started and how the Group first came to me. I spoke about the messages from the Group and the basis of the work we were doing. I was surprised to find that most of the people in the room had been reading the Beacons of Light Meditations for some time. It seems that the Messages from the Group get passed around in the internal e-mail system of the UN. They were ready for the information and very anxious to see us. It turned out that we were a validation for them as well. We were a little anxious about meeting Lightworkers from different countries but after about five minutes of talking and looking into the smiling, eager eyes in the audience, I realized that we were Home and this was family. I shared the Sword, Scepter and Quill with everyone and explained how we used each tool in the seminars to illustrate the information that the Group has given us. It was very special to see some of the special warriors of the Light holding the Sword again. I had been very concerned about jet lag and having to present something so important to me only a few hours after getting off a plane, but the moment I stepped up in front of the crowd the Group came in and I became energized. After a short break I began the channel from the Group. They had decided to not let me in on what we were going to talk about. Normally I would have been very nervous about them not telling me the subject of the channel but I was simply too busy to worry about it. I'm really beginning to get very comfortable with the live channeling. Writing was my first form of channeling so this is relative new for me. I am now getting very comfortable with speaking in a collective voice and live channeling. Now I just open to the flow. The timing of our trip put us in Vienna during the Kosovo crisis, which was only a few hundred miles from our location. Several people asked for answers as to why this was happening. They also wanted information about the role of the refugees. There was a real sadness in the air caused by this situation. This was the first information contained in the channel from the Group. They spoke of the role these wonderful people were playing and how their sacrifice would facilitate the further advancement of humanity. They spoke of the fact that it was appropriate to speak your truth in all situations including this one. Many of those in Vienna still have scar tissue from the last time this was attempted in the days of the holocaust. Once again, the Group said that our awakening on this planet began in earnest the day that Hitler left. It was our collective raise in vibration that said we would never give our power away like that again. The Group began to speak about the Universal energy, and how it was all about blending. They used the illustration of tides in the Ocean that actually balance the rotation of the Earth. This constant movement of energy (water) is always seeking balance. To seek balance and blending is the way of the Universal energy. To support that blending will place you in the Universal flow. To oppose that energy would be against the Universal flow and would not be supported. They gave illustrations about how all actions should be compared to the flow of Universal Energy. They said that action supporting blending and the removal of imaginary lines of separation would help us make the shift as humanity moved forward. Those actions that resisted blending and encouraged segregation would not be supported. They spoke of how all things begin as a single heart. If there is a misdirection of energy that goes against the Universal flow then it would find resistance. If the resistance was ignored then the misdirection would attract others with similar mis-directions and soon there would be a community misdirecting energy. If that continues, like attracts like, and soon you have an entire country misdirecting energy. They did also say that if ever the majority of the planet began misdirecting energy then the Mother would end the Game and the cataclysmic end times would be visited upon the Earth. They also said to keep in mind that the events of Kosovo were a chance to shine Light where Light had not been for some time. They were not talking about a geographical location but rather, an idea of ethnic cleansing. They made it clear that we were in the higher vibrations and these actions would now meet abrupt opposition. They said that the words "fight" and "war" would not be in our vocabulary long, but it was also very important that we took a stand and spoke our truth and created our own reality. In many ways it was like having a chance to re-affirm the direction of the new Earth. They greatly honored those who accepted the role of victim. They said that they played very important roles that would not go unnoticed, and that we all owe them a real debt of gratitude. Although the subject was prompted by the situation in Kosovo, it was about a much higher subject. It was about the flow of Universal Energy and how that is a guide for everything in our lives all and actions on the planet. They said that even our little decisions in everyday life can be compared to the flow to see if it is a misdirection of energy. They said that on government levels it is easy to see haw all actions and policies are either in the flow, or against it. They said there is no judgment about which one we choose, except that some actions get the desired results and others do not. They [The Group] pointed to the Euro currency as a perfect example of blending and erasing imaginary lines that we call borders. They said we strengthen the bonds between us as we encourage becoming citizens of the Earth. They said once we get that in place we can start working on becoming citizens of the Universe. They talked about those who will be coming soon to help us understand our true heritage. And they said when that happens we will very quickly drop our imaginary boundaries and become citizens of the new Planet Earth. They spoke of our galactic neighbors and how varied they are from one another. They said that when they begin to show themselves, we will then see how very much alike we really are here on Earth, and we will bond as citizens of the planet. The other points they spoke of were related to taking and holding our true power while still in biology. They spoke of the planetary alignments that have caused so much turmoil in recent times and spoke of the role of humanity on the Game-board. They spoke of the physical changes that were to be expected, and the awakening of humanity. All in all, they gave a basic message that firmly placed the choices, as well as the responsibility for those choices, in the hands of those in attendance. They gently but firmly re-minded us that through our choices we hold the power of creating our own future. At the end of the channel there was time for all to ask question of the Group. There were many interesting questions that ranged from asking about the 23rd Universe to how we can better re-member who we are. One question that produced and interesting response from the Group, was asked by a scientist from the Atomic Energy Agency. He asked about the nature of synchronicity as it related to the three dimensional representation of the sparks of God that I had placed on the board. The basis of their answer was that he was making things more complicated than they really were. The concept of God was too simple to fit in three dimensions. The questions came from Lightworkers in all walks of life. At the end of the channel I opened my eyes to find that I had sat a little too close to the front row as everyone was in tears. I know that there is a proximity issue with this and have learned to tell people so they can choose if they wish to be in the flow of tears or not. At the very end as we all shared long overdue hugs and a wonderful Lightworker came up to me beaming from ear to ear. She was there to greet us, and had brought her friend along to translate because she did not speak English. She told her translator to tell me that after about five minutes of translating she had told her stop. She was getting the message just fine, and as she wiped the tears from her eyes she pointed to her heart. The translator told me she "heard" every word. One of the most wonderful experiences at the United Nations was what happened several days later. Our host Lourdes asked us back to the UN for lunch. We got to really take a look around during the working hours and saw more than we imagined. The Vienna International City houses a lot of Lightwork, and it was really great to have the opportunity to be taken on a private tour of this vast place. Just before we left we had coffee and desert in one of the café's. During the short time we sat at the table, about five people came by who had been either at the channel at that had attended the seminar, and we were greeted with hugs from family. This was more than I could have hoped for, and for the first time I realized that Barbara, the Group and I had a wonderful role of re-connecting family all over the world. We did a two day seminar in the heart of Vienna, at which the Group shared more about the family of Michael in this very special place. They said the energy of Michael was very strong in that geographical location, and this was the reason we were finding each other now. In more ways than one we really had remembered Home. We were deeply honored to have been asked to share this message with these important Lightworkers at this critical time on our planet. We have been asked to return in April 2000 and have gratefully accepted the invitation. Barbara and I are so honored to be able to carry this message and connect Lightworkers worldwide. We thank all of you for holding the energy to make this possible. Together we are changing the world and creating Heaven here on Earth. One heart at a time. Steve, Barbara and the Group. Perhaps you will now begin to believe what is really going on today. There is so much more than what I have spoken of above connected with the UN. For those of you who may say "So what!" to all we are speaking about here, I respond by saying that those who discern the signs of the times will not be taken by surprise when the coming persecution begins with a vengeance. The time has come to prepare our congregations for a difficult future. Not only that, but it becomes all the more important to witness powerfully into the present world situation. Don't smugly immerse yourself in futile fantasies about world revival. There aren't going to be no such thing. Neither should we hide out in the hills with a generator and dried food supply quietly waiting to be raptured.